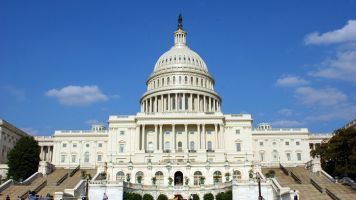 Lawmakers reached a bipartisan agreement that will fund federal agencies through September, avoiding a government shutdown. It looks like Congress will avoid a government shutdown. Lawmakers worked out a $1 trillion-plus bipartisan agreement to fund federal agencies through September. The temporary budget passed Friday only funded the government through May 5. The deal includes an increase in defense spending, more money for border security and millions to reimburse New York City law enforcement for its protection of the president's family in Trump Tower. Most notably, the deal does not include funding for President Donald Trump's U.S.-Mexico border project. Congressional Republicans also helped pass a permanent fix to funding for coal miners' health care and allowed the Democrats to increase funding for medical research, despite Trump's desire to decrease it. No one is entirely sure how the White House and conservative Republicans will respond to the deal once it moves to a vote. The budget, which still needs to be voted on, would be the first major bipartisan measure approved during the Trump presidency. Democratic Senate minority leader Chuck Schumer called it "a good agreement for the American people." During a rally marking his 100th day in office, Trump reiterated his promise to build a border wall and repeal the Affordable Care Act. But with both absent from the budget bill, it seems he still needs to do a lot of persuading on Capitol Hill.